Audi Black & Gold Hoops Wheel Centre Stickers. Set of 4. 50mm. Audi Black & Silver Hoops Wheel Centre Stickers. Set of 4. 50mm. Audi Black & Silver Oval Stickers. 4" Pair. Audi Brown & Cream Oval Stickers. 6" Pair. Audi Coupe GT Text Cut Vinyl Stickers. 7" or 9.5" Pair. Audi Cut Vinyl Red Oval Sticker. 17.5". Audi Driver 2 Fingered Salute Sticker. 3.5". 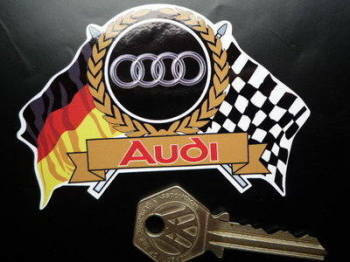 Audi Flag & Scroll Sticker. 3.75". Audi Germany Tricolour Style Stickers. 2" Pair. Audi Hoops Cut to Shape Fade To Bottom Stickers. 8" Pair. Audi Hoops Plain Cut to Shape Sticker. 12"
Audi Hoops Style Oval Garage Workshop Wall Plaque Sign. 11.5". 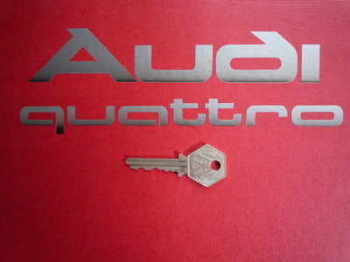 Audi Number Plate Dealer Logo Cover Stickers. 5.5" Pair. Audi Quattro 1984 Monte Carlo Rally Winner Lick'n'Stick Window Sticker. 5". 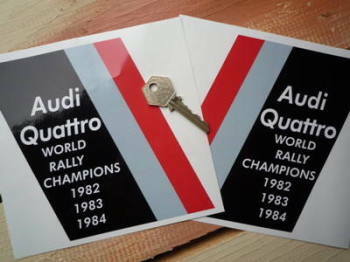 Audi Quattro 1984 Monte Carlo Rally Winner Sticker. 7". Audi Quattro Cut to Shape Stickers. 8" Pair. Audi Quattro State Express 555 Rally Sticker. 5". Audi Quattro World Rally Champions Stickers. 11" Pair. 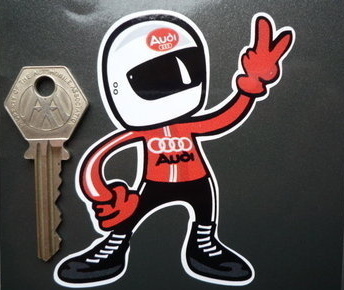 Audi Quattro World Rally Champions Stickers. 6" Pair. Audi Red & White Oval Stickers. 3.75" Pair. Audi Red Oval Sticker. 10". Audi Red Oval Wheel Centre Stickers. Set of 4. 50mm. Audi Sport Circular Stickers. 3.5" Pair. Audi Sport Cut to Shape Stickers with Hoops. Various Colours. 20" Pair. Audi Sport Cut to Shape Stickers with Hoops. Various Colours. 6" or 10" Pair. Audi Sport Cut Vinyl Sticker. 12". Audi Sport Cut Vinyl Sticker. 15.5". Audi Sport Handed Parallelogram Stickers. 1" Set of 4. Audi Sport Handed Parallelogram Stickers. 4" Pair. Audi Sport Handed Parallelogram Stickers. 8" Pair. Audi Sport Modern Text Cut Vinyl Stickers. 8" or 9.5" Pair. 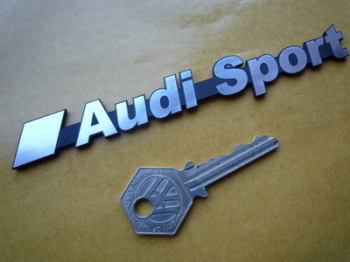 Audi Sport Number Plate Dealer Logo Cover Stickers. 5.5" or 7" Pair. Audi Sport Oblong Stickers. 2.5" Pair. Audi Sport Text at Bottom Style Handed Parallelogram Stickers. 2" Pair.